May 24 – June 20 2018- Challenge Completed! July 7 – July 20 2018- Challenge Completed! visit dc.iceboxchallenge.com for more details! Take DC Challenge on our DC site! 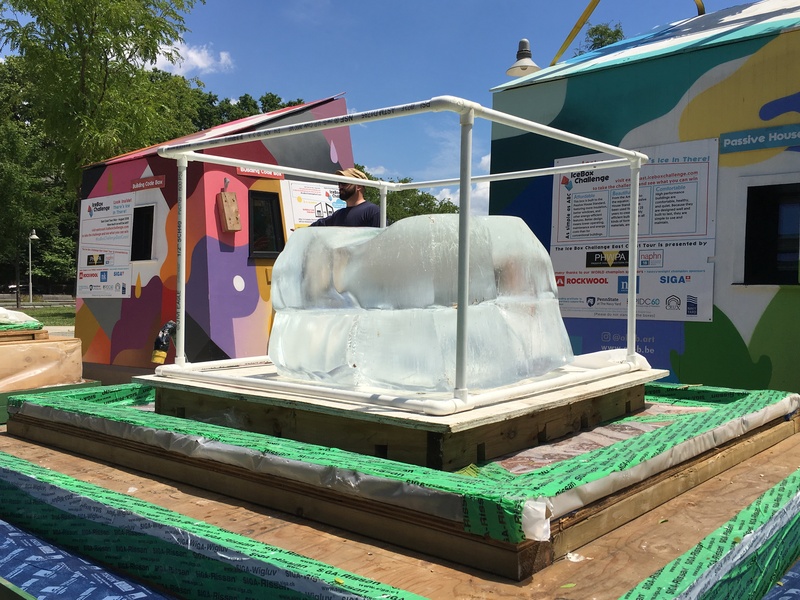 The #IceBoxChallengeEastCoast is a contest and an experiment to demonstrate how a home can be super energy efficient AND comfortable. The Ice Boxes are left outside in the sun for 18 days. When they are opened, the amount of ice left in each box will be measured. How much ice is left shows how well each Ice Box keeps out the summer heat. Better building design can help us reduce our carbon pollution without changing our behaviour. Energy-efficient homes are comfortable, quiet and healthy. So How Did it Go, Philly?! 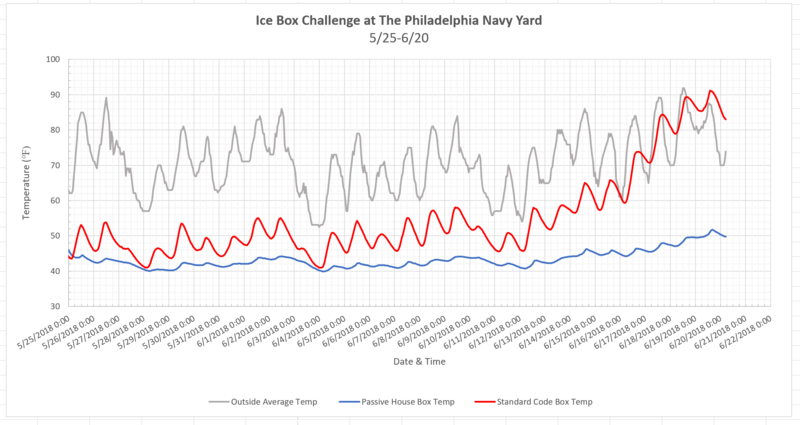 The Philadelphia Navy Yard hosted the Ice Box Challenge from May 24 to June 20, 2018 at League Island Park. Starting at this leg of the Challenge, we placed temperature loggers in the boxes to track just how energy efficient Passive House Standard is. This is a graph of the outside air temperature and inside air temperatures of the ‘Standard Building Code’ and ‘Passive House’ ice boxes. At this time of year, when the outside air temperature remains above that of ice both day and night, the direction of heat flow is constantly inward, and this heat influences how quickly the ice melts. Note the air temperature inside of the Standard Building Code box (the red line) clearly warms on most days, then cools down at night. The air temperature inside the Passive House box (the blue line) is consistently cooler, as less heat is transferred into the box and available to melt the ice. The gray line shows the average hourly outdoor air temperature. The large spike and then drop in temperature towards the start of the graph is when the loggers were turned on and set out in the sun as we set up the boxes. At the end of the Challenge, the boxes were lifted and the results were revealed. The white frames represent the original size of the ice blocks. Pictured left, the Standard Building Code Box was empty, while the Passive House Box had about 300 lbs of ice left. Notice in the graph how the Standard Building Code Box stayed hotter for longer than the actual outdoor air temperature towards the end of the challenge! Because Passive House Standard is better insulated than Standard Building Code, the Passive House box was able to become cool and stay at a low temperature, while the Standard Building Code box retained more heat and fluctuated with the outdoor air temperature. High-performance buildings are reliable, affordable, comfortable buildings that use energy efficiently, so you’re heating or cooling only your home and not the outdoors. They stay comfortable and quiet throughout the year, including through summer heatwaves, winter storms and power outages. The buildings use up to 90% less energy for heating and cooling than other buildings do, while maintaining good indoor ventilation and air quality. They are easy to maintain. They are also affordable to build, own, live in and work in. The challenge is presented by Passive House Western Pennsylvania, along with the North American Passive House Network 2018 Conference + Expo. 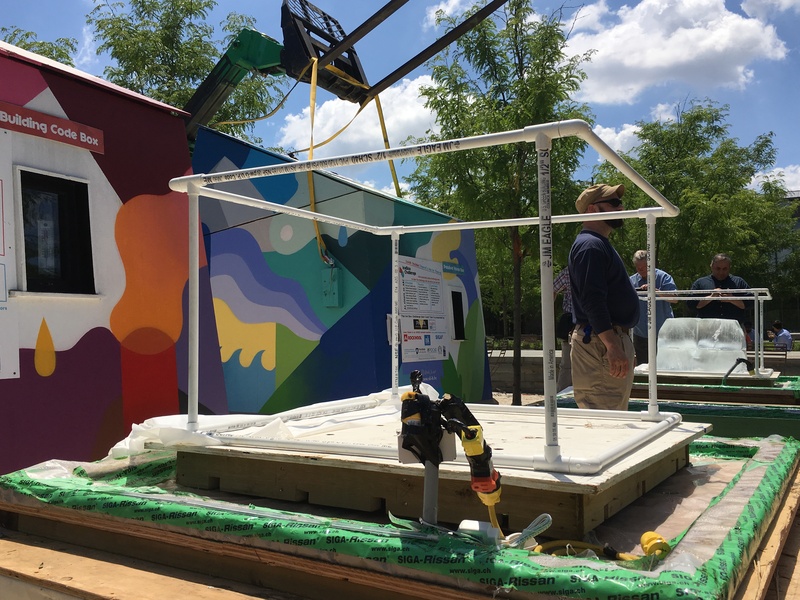 A Passive House approach is rapidly becoming a favored and well-understood method of achieving high performance building enclosures in cities along the east coast and beyond. Many thanks to our Champion Sponsors – NK Architects, ROCKWOOL, SIGA. The Ice Box Challenge East Coast Tour extends its gratitude to our partners: Penn State at the Navy Yard, The Pennsylvania Industrial Development Corporation, Crux Homes, and the Philadelphia Navy Yard. Questions or comments? Contact us through the form below.